The teasing is finally over. We got our first look at Dell's Yoga-esque XPS 11 2-in-1 convertible Ultrabook in June, and Dell followed up with a deeper look at the device in October. Now, after nearly half a year of build-up, the latest addition to Dell's Windows 8 line-up is available for sale, alongside a refreshed XPS 13 Ultrabook. Pricing for both laptops starts at $1,000, and Dell is offering something for every PC enthusiast with these devices--including Windows 8 haters. For anyone who wants a laptop that can double as a tablet or a tabletop touch display, the XPS 11 (pictured above in tablet mode and with a folded-back screen) is worth a look. The XPS 11 is very similar to the Lenovo IdeaPad Yoga covertible devices, being a laptop-style hybrid whose screen can fold all the way back, transforming it into an impromptu tablet for those lean-back-friendly occasions. The base model XPS 11 comes with an 11.6-inch display with 2560-by-1440 resolution, a dual-core 1.5GHz "Haswell" Core i3-4020Y, 4GB RAM, an 80GB SSD, Intel integrated graphics, a cutting-edge 802.11ac Wi-Fi adapter, and Bluetooth 4.0. 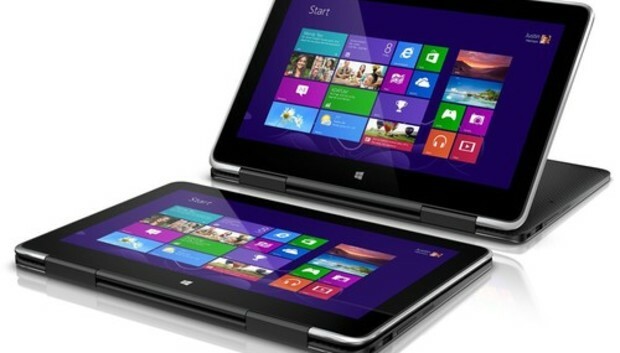 The XPS 11 comes pre-loaded with 64-bit Windows 8.1. The XPS 13 traditional Ultrabook is also getting a refresh. The new base model version features a 13.3-inch display with 1920-by-1080 resolution, a dual-core 1.7GHz "Haswell" Core i3 processor, 4GB RAM, 128GB SS, the same Wi-Fi and Bluetooth features as the XPS 11, and 64-bit Windows 7 Home Premium. (You read that right: Windows 7!) The XPS 13 weighs in at 3 pounds for the base model. Bumping up from the $1,000 XPS 13 to the $1,300 version dumps Windows 7 for Windows 8.1, a touch screen and a dual-core Haswell Core i5-4200U. At the same time that Dell is shipping its new XPS models, the company is also rolling out the M3800 Mobile Workstation, a laptop announced in October aimed at engineers and digital content creators. At $1,800, this laptop is pretty pricey for those of us who just need to fill out a spreadsheet or type up a Word document. But we can still admire it. This monster device weighs in at 4.15 pounds, which is pretty good considering it comes with a 15-inch 1080p display, 8GB RAM, 500GB hybrid drive, quad-core "Haswell" Core i7-4702HQ, and Nvidia Quadro K1100M graphics with 2GB dedicated memory. All three Dell devices are available now.